Amazon.com description: Product Description: Taking Sides volumes present current controversial issues in a debate-style format designed to stimulate student interest and develop critical thinking skills. Each issue is thoughtfully framed with Learning Outcomes, an Issue Summary, an Introduction, and an Exploring the Issue section featuring Critical Thinking and Reflection, Is There Common Ground?, and Additional Resources. Taking Sides readers also offer a Topic Guide and an annotated listing of Internet References for further consideration of the issues. An online Instructorâs Resource Guide with testing material is available for each volume. Using Taking Sides in the Classroom is also an excellent instructor resource. Visit www.mhhe.com/takingsides for more details. About: Taking Sides volumes present current controversial issues in a debate-style format designed to stimulate student interest and develop critical thinking skills. 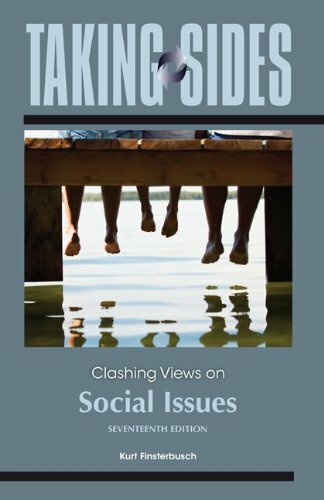 About: TAKING SIDES: SOCIAL ISSUES, 15/e EXPANDED presents current controversial issues in a debate-style format designed to stimulate student interest and develop critical thinking skills.